* An exhilarating, soothing herbal scent. * A favorite for generations. Today’s scent is lighter, fresher. You guys most have been wondeing what the help is wrong with me putting a blog for a bar soap. Well the reason is that this Yardley Of London Flowering English Lavender is my Ambien [Ambien is a pill for people that cant sleep or have trouble sleeping...]. I bought three bars the other day at Walgreens, I usually bought the oatmeal one which is also good really good leaves your skin so soft. 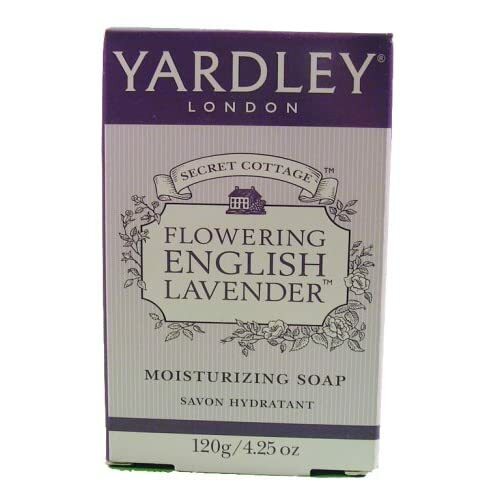 But then I always looked at the Yardley Of London Flowering English Lavender and wonder if they were good hey do have a strong Lavander smell but that is the whole point. I went on the net searching for pics for this blog and I found at amazon.com that they sell them but people say the quality have changed that it used to be stronger [the lavander smell]. Now I wish I could get one of those stronger smell soap bar. But theyalready announc like they wont be mking them any more like that cause it is kind of expensive i guess "Today’s scent is lighter, fresher." Anyways this is so good after going to bed it is the only thing that help me sleep. HOnestly i go right to dreamland I dont even hear the alarm on the morning. So for now on it will be Yardley Of London Flowering English Lavender for me.